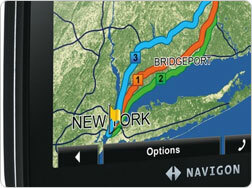 NAVIGON today said it would quit its GPS device business in North America but may offer its software on the iPhone and other platforms in return. The company doesn’t tell GPS Business News how quickly it expects to leave but says the decision stems from too-stiff competition at the low end of the GPS business. Where its business had been comfortable as long as large rivals like Garmin and TomTom kept their navigator prices higher, the push down to as low as $99 (for a TomTom ONE) has left NAVIGON with little way to differentiate itself. In exchange, the company plans to expand by making its software available on other GPS-capable devices, particularly smartphones. Company chief Egon Minar specifically says an iPhone version through the App Store is a possibility courtesy of OS X iPhone 3.0′s support for turn-by-turn navigation but that it depends on price competitiveness, as other rivals are likely to introduce their own dedicated iPhone GPS apps. Besides cost, NAVIGON has primarily sold its devices on offering features at a lower overall price, such as free lifetime traffic updates, lane assist and multi-route selection. This entry was posted on Wednesday, May 20th, 2009 at 4:00 am	and is filed under iphone, Mapping, Merchandi$e. You can follow any responses to this entry through the RSS 2.0 feed. Both comments and pings are currently closed.